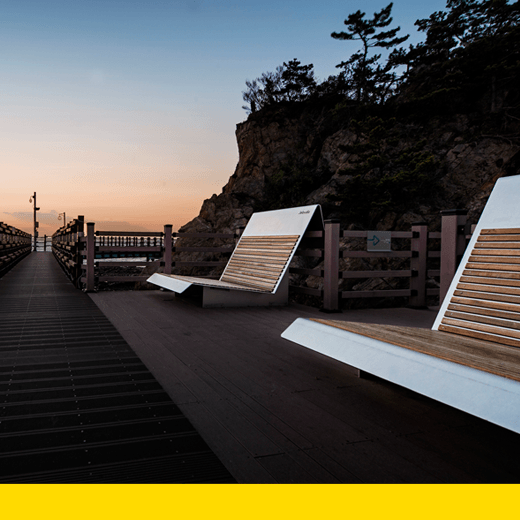 SEAt is a public bench system that was designed for Jebudo, an islet off the western coast of Hwaseong, South Korea. SEAts were installed on a 2.3-killometer-long boardwalk along the Jebudo coast. Like many dying islands and remote areas in Korea, Jebudo had been struggling with depopulation, an unstable economy and a decline in tourism. This project was designed to transform the way visitors experience the seascape. SEAt discretely accommodates the different needs of visitors while not consuming the surrounding nature. Visitors can relax, engage and socialize with its seven typologies: standing, sunbed, swing, bar, amphitheater, nest and terrace. Collaborating with the glass walls as a part of the design, visitors can explore Jebudo’s landscape effortlessly, producing an almost seating-on-the-sea sensation. Designed as landscape sculptures for seating, viewing, playing and resting, SEAt entices visitors to pause and embrace the vast drama of the seascape.